With only a few days to go until the King George VI and Queen Elizabeth Stakes at Ascot it seems an ideal time to highlight one of the first and most celebrated winners, Aureole, who gave Her Majesty the Queen a memorable victory in 1954. Although the colt failed to win a classic, he was famously second to Gordon Richard’s Pinza in the 1953 Derby just four days after her Coronation. While other horses in the Queen’s colours have won a classic, Aureole is arguably her greatest horse enabling Her Majesty to be the leading owner in 1954. In addition, he had a highly successful career as a stallion topping the sire charts in 1960 and 1961. Impeccably bred, Aureole was sired by Hyperion the Derby and St Leger winner in 1933 and the leading sire six times (1940-42, 1945-46 and 1954). His dam Angelola, who finished second in the Oaks in 1948 and won the Yorkshire Oaks, came from a royal line of Donatello II and Feola. The latter, who herself was placed in both the 1,000 Guineas and Oaks of 1936, cost £3,000 as a yearling in 1934 for King George V, and proved to be a gem of a broodmare and the mainstay of the royal breeding cause. Two years before throwing Angelola, Feola gave birth to Hypericum winner of the 1946 1,000 Guineas for King George VI. Aureole’s mother Donatello II, bred by the distinguished Italian breeder Signor Federico Tesio, won 8 of his 9 races and was the sire of the 1957 Derby winner Crepello. A bright chestnut of 16 hands with a white blaze and three white socks, Aureole was bred by King George VI. On his death in February 1952, ownership passed to the Queen. The colt was temperamental and excitable, traits which illuminated his future racing career and were typical of some of Hyperion’s offspring. Aureole spent a formative year at the Mondellihy Stud in County Limerick where he is said to have relished being chased by stud staff in the evenings as they attempted to retrieve him from the paddocks. Aureole was sent into training with Capt Cecil (later Sir Cecil) Boyd Rochfort (1887-1983) at Freemason Lodge Stables in Newmarket. He believed the best Hyperions were difficult and full of fire, like Hypericum, who unseated Doug Smith before the start of her 1946 classic triumph and had ran loose delaying the 1,000 Guineas for approximately 15 minutes. Aureole certainly was and had a habit of decanting his work riders on Newmarket Heath when he began working on the gallops. His two year career began on the 19 August in the six furlong Acomb Stakes at York’s Ebor meeting. Seemingly relishing the firm going, though running very green he came with a late run to win easily with stable jockey, Harry Carr (1916-85) on board. His only other appearance as a juvenile came in Newmarket’s prestigious Middle Park Stakes in October. Slowly away he finished 6th of 9 at 8/1 behind convincing winner Nearula. Nearula was regarded as the top two year old of 1952, heading the Free Handicap weights with 9st 7Ib’s. Aureole was allocated 8st 8Ib’s whilst future star Pinza was allotted 9st 2Ib’s. However, connections felt with his breeding Aureole would favour longer distances and a classic three year old campaign beckoned in the young Queen’s Coronation Year with the principal objective being the Derby. One area of concern at this early stage was the colt’s temperament. To counter this Boyd Rochfort asked Doctor Charles Brook a London neurologist to treat Aureole. Brook had developed a technique for controlling nervous impulse in animals, which resulted in visits from Dr Brook into mid summer 1953. The colt’s first run in 1953 came in the 2,000 Guineas at Newmarket on 29 April with Her Majesty there to cheer him on. Second at half way with Carr on board the colt dropped back but ran on well to finish 5th of 16 runners behind Nearula. Though beaten more than 10 lengths by the winner the racing experts believed he was outpaced over a mile, but thought he would be ideally suited to the Derby distance. Interestingly in 2nd place was the filly, Bebe Grande ridden by one of the museum’s dearest friends Willie Snaith. To confirm his Derby credentials Aureole then proceeded to breeze home 5 lengths clear in the Lingfield Derby Trial. Many observers thought that the 2/1 favourite could emulate the 1952 winner, Tulyar, who went on to Epsom glory. Full of confidence the Freemason Lodge team now headed to Epsom where Cecil Boyd Rochfort was in fact double handed as he also trained the fancied Premonition, who had won two major Derby trials at Epsom and York. Four days before Derby Day, on Tuesday 2 June a far more important occasion had taken place, the Coronation of Queen Elizabeth at Westminster Abbey. Approximately three million people lined the streets of London to catch a glimpse of the new monarch, whilst street parties had been held all over the country. To cap the week the nation now needed a royal Derby winner. Twenty seven runners went to post for the 174th Derby on slightly firm going with Pinza and Premonition joint favourites at 5/1, Aureole was 9/1. 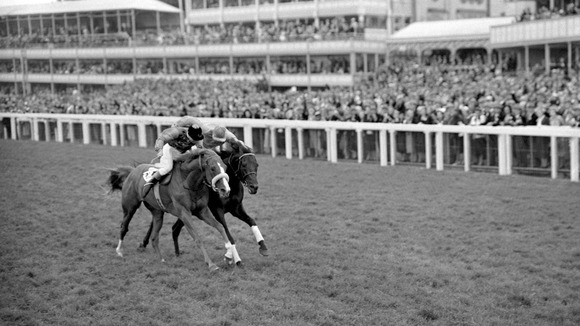 Whilst Her Majesty seemed relaxed amongst an estimated crowd of 500,000, not surprisingly Aureole broke out in a sweat in the paddock and took a strong hold as Harry Carr rode him down to the start. The colt failed to take up a good position early on, but he moved up to 9th at the top of the hill and was 6th at Tattenham Corner. However, by the time he had moved into 2nd place, Pinza had the race won skating home by 4 lengths. Five days earlier Gordon had been knighted in the Coronation Honours list and now had won his first (and only) Derby after 27 previous attempts. The Royal colt suffered a bout of coughing in the lead up to his next run, the Eclipse at Sandown, where his lack of pace left him in 3rd place behind French horse Argur. The race probably helped Aureole in his preparations for the King George VI and Queen Elizabeth Stakes, a race then in its infancy with Supreme Court and Tulyar being the first two winners of the race. Unfortunately for Aureole, Pinza the powerful Derby winner was again his principal opponent amongst a field of 13 which also included Nearula, (only 9th in the Derby) who had since won the St James’s Palace Stakes at Royal Ascot along with the last two runners up in the race, Zucchero (1951) and the French challenger, Worden II (1952). The Queen’s horse was soon part of the drama, as leaving the paddock the French colt Pharel lashed out and caught him in the ribs. Aureole reared up and jockey Harry Carr was thrown to the ground. For once it wasn’t Aureole’s own disposition which had caused the problem, though thankfully both horse and jockey emerged unscathed. Pinza again proved too good for Aureole. Rounding the home turn Aureole was well placed behind the leaders, but two furlongs from home Pinza swept into the lead. Aureole was unable to respond with a serious strike and like Epsom he chased home the top European three year old colt of 1953. The eventual winning margin was three lengths though Richards could easily have extended this if he had wanted. With Pinza an absentee after injuring a tendon, Aureole went to post for the St Leger as a strong favourite at 5/4 with the Queen and Winston Churchill in attendance. Although expected to stay the distance, the horse pulled hard throughout the race, never settled and when asked by Carr to mount a challenge he swerved to the right and found nothing in his reserves. All his exertions had taken their toll and he eventually finished 3rd behind his stable companion, Premonition ridden by Eph Smith. Whilst his final race of 1953 was a comfortable 1 ½ length victory in the Cumberland Lodge Stakes at Ascot over 1m 4 furlongs, it did not come without controversy. Eph Smith (1915-72) took the ride as Harry Carr was unable to make the weight, but Captain Charles Moore, the Queen’s racing manager, also decided that Smith should now retain the ride on the highly strung colt. He felt that Aureole was more relaxed under Smith although Boyd Rochfort was not convinced. Arguably Aureole’s best performances in 1953 had come in defeats behind Pinza, but the following year he had a much more fruitful campaign, winning four of his five races. He not only benefited from Pinza being retired to stand at stud, but there were also some signs that his temper had mellowed, perhaps Dr Brook’s healing hands had had some affect. Furthermore he had grown into his frame to become a strapping thoroughbred. His only defeat came in his seasonal debut at Sandown in the Coronation Stakes over ten furlongs, finishing second behind Chamier, the 1953 Irish Derby winner. Not only was the trip too short for him, but he had also been boxed in on the rails, forcing Smith to leave his run too late. A fortnight later he easily won the Victor Wild Stakes at Kempton Park over 1m 4f by four lengths before the colt returned to Epsom for the Coronation Cup. By now Aureole was developing into the premier four year old middle distance horse in Europe and at Epsom he again beat a familiar foe in Nearula, who came third, while Chatsworth was 5 lengths behind in 2nd place. Their followed a Royal winner at Royal Ascot as Aureole put in a determined performance to beat the French raider, Janitor, by a short head in the Hardwicke Stakes after a photograph, despite having to give the latter 7Ib’s. Significantly Aureole had responded courageously to his jockey Eph Smith who had needed to use the whip to fight back against his Gallic opponent. These two victories set up Aureole for what proved to be his final challenge the King George VI & Queen Elizabeth Stakes at Ascot on 17th July 1954. The star studded field of 17 included overseas challenges, Janitor and Vamos (6th in 1953) from France, Italian Derby winner Botticelli and Irish horse Chamier. Also in the line up were the horses that finished 2nd, 3rd and 4th in the previous months Derby, Arabian Night, Darius and Elopement along with Rashleigh, who had beaten Derby winner Never Say Die at Royal Ascot in the King Edward VII Stakes (The Ascot Derby). The race was run on ground described officially as dead, but most observers didn’t expect this to hinder Aureole who was made the 9/2 favourite. Typically, Aureole was soon up to his usual tricks and unseated Eph Smith onto the soggy turf as he made his way to the start. Fortunately both horse and jockey were able to continue though up at the start the colt played up and not surprisingly he was slow away when the tapes went up. After a furlong he only headed one of the 17 runners. Smith sensed the need to be up with the leaders in such testing conditions and by halfway he had joined the leading group. Turning into the straight the royal colt was 2nd. With two furlongs to go Smith kicked for home leaving Darius and Vamos as the only serious threats. A furlong out the fast finishing Vamos almost reached Aureole’s quarters before Smith administered some sharp reminders with the whip inside the last 100 yards to hold off the French raider with Roger Poincelet on board. The final margin of victory was three quarters of a length with Darius a further two lengths back in third. The Queen was ecstatic hurrying down from her box to the members’ enclosure. It was clearly an emotional experience for the young Queen to win the race named after her parents with a horse bred by her father. Furthermore, like Estimate in last year’s Ascot Gold Cup, her spontaneous reaction confirmed her great love of the turf. An invitation to send Aureole to the USA for the Laurel Park International in the autumn was declined as it was felt he had proved himself the best middle distance horse in Europe. Instead after winning seven races worth £36,224 from fourteen outings with three 2nd’s and two 3rd place finishes he retired to stand at Wolverton Stud, an annexe of the Royal stud at Sandringham. Like his father Hyperion he proved a champion sire. He was responsible for English classic winning colts St Paddy (1960 Derby & St Leger), Aurelius (1961 St Leger) and Provoke (1965 St Leger). He also sired St Crespin III the 1959 Prix de L’Arc De Triomphe winner and Sir Winston Churchill’s colt, Vienna (3rd in St Paddy’s St Leger) the sire of Vaguely Noble who won the Longchamp race in 1968. Vaguely Noble was himself the champion sire in 1973 and 1974. Sadly his progeny failed to produce Group 1 winners for Her Majesty or provide the talented filly for the Queen’s studs to breed from. Despite this Aureole remained a firm favourite of the Queen who would regularly visit him in his paddock where she enjoyed feeding him with mints. The colt who almost added a fairytale moment to the Coronation Derby retired from stud duties in 1974 and died the following year at the age of 25. This Saturday Telescope another 4 year old trained at Freemason Lodge has ambitions of making the Hardwicke Stakes and King George double just like Aureole sixty years ago.